Grayson Perry has curated an exhibition at the British Museum that combines his own work — ceramics, textiles, ironwork — with objects from the museum collection. Which must have been *the most fun ever*. I mean seriously, I’ve spent hours browsing the BM’s collection online, looking for things to post to Tumblr, but how much more fun to actually wander around the stores, talking to the experts, poking around in drawers and cabinets, and actually handle everything, with an open-ended brief to find anything which is beautiful, or interesting, or funny. In fact, if it had just been stuff from the collection with some commentary from Perry, that would be enough to make a very interesting exhibition, because he always writes well and interestingly about art and he clearly has an excellent eye. But the inclusion of his own work does work well. His work always combines a seriousness with humour and absurdity, and its presence affects the way you look at the other objects. Human beings often are absurd, after all, and museums aren’t always the best places to bring that out. For that matter, museums don’t always do seriousness very well. I mean, they’re good at dry, academic seriousness, but they don’t necessarily create the environment for human seriousness. And in turn it gives you some insight into how he sees his own art to see the things he’s chosen to show alongside his work, and the themes he arranged the exhibition around: pilgrimage, magic, sexuality, maps and so on. And since I haven’t said so explicitly yet: Perry’s work is interesting and attractive in its own right. So, yeah, a playful, entertaining exhibition full of striking, interesting and beautiful things. Go and see it. 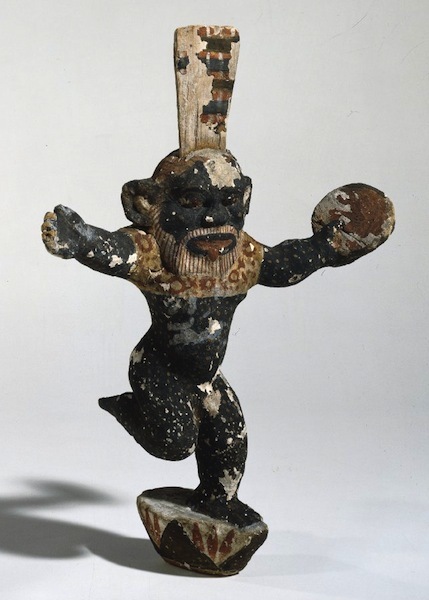 » The image is of a painted wooden figure of a dancing Bes holding a tambourine, standing on a lotus. It’s Egyptian, from about 1800BC. It is from the BM, but it wasn’t in the exhibition.